I love roasting a whole chicken and then using leftovers in a variety of ways. 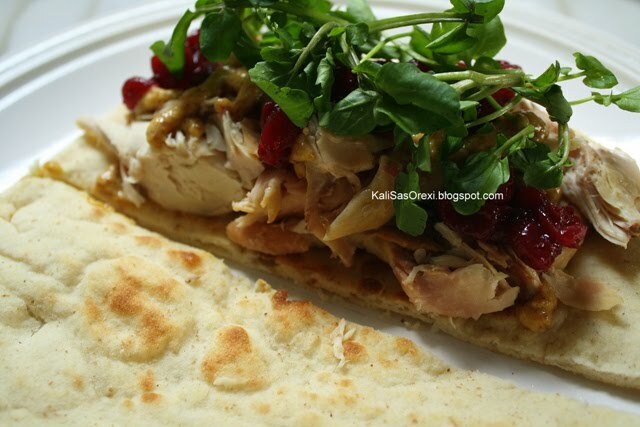 My favorite as of late is this pita sandwich with roast chicken, homemade cranberry sauce, sweet and tangy honey mustard and fresh watercress. It’s a satisfying little sandwich and it’s pretty healthy. I used Greek pita bread that I placed under the broiler for a couple of minutes to get some color but you can obviously use any bread you wish. Layer some roast chicken breast over one half of the pita and top with honey mustard, cranberry sauce and a handful of watercress. Top with the remaining pita half and enjoy! Now don’t be fooled by the roast chicken being listed here first: the star of this sandwich is the fresh cranberry sauce. Sweet and tart with a hint of ginger, the cranberries take this sandwich to a whole new level. And considering shelves are stocked with tons of fresh cranberries, sauces and chutneys such as this will be creeping into our dishes pretty regularly over the next month or so. 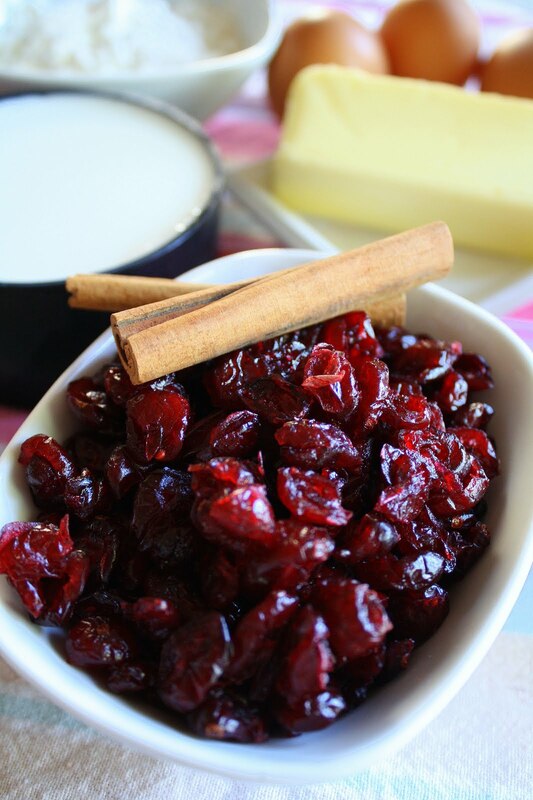 Below, I’ll just share my recipe for a simple cranberry sauce but in the coming weeks will also write up the recipe for my favorite cranberry chutney … so stay tuned! As I was already using my oven to roast the chicken, I simply combined all the ingredients in a baking dish, covered with foil and baked it until reduced to a thick, chunky sauce. Alternatively, just combine all the ingredients in a saucepan and simmer until the cranberries are soft and the sauce is thick. We eat fish quite a bit: I pan fry whole porgies or cook them in a foil “pouch” with oregano, garlic and olive oil on a weekly basis. But more supple fillets of fish inherently prone to overcooking, usually pose a problem as they demand a bit more attention than I can offer on a weeknight. It was only just recently I figured out a solution to this problem; it was only just recently I figured out that poaching fish in olive oil is an unbelievably forgiving method of cooking delicate fish that yields such amazingly tender, moist results. I cannot sing this method’s praises enough: it’s so simple and so easy, more importantly poaching really lets the fish shine and using good olive oil means it’s healthy. 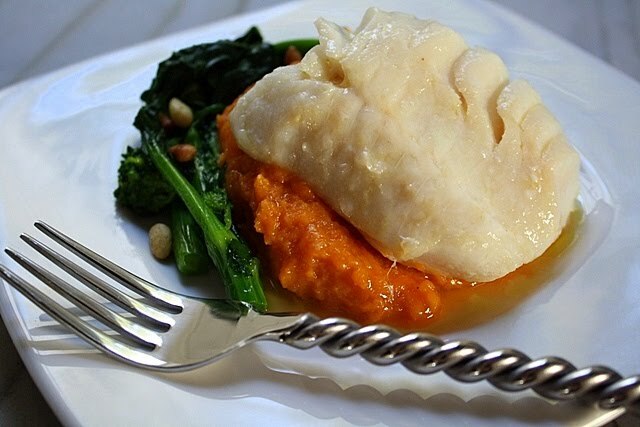 In this dish, I used some fresh cod, which is thick and meaty, but I’m certain halibut would work just as well here. 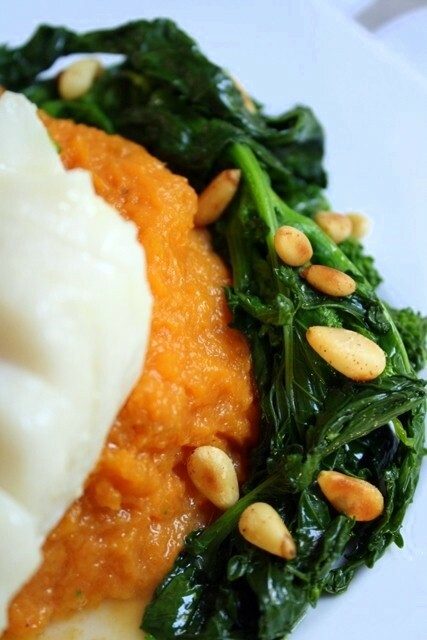 I served the olive oil poached cod over mashed sweet potatoes flavored with grated ginger and a touch of cream as well as some sauteed broccoli rabe with pine nuts toasted with a dash of cayenne pepper. The kids gobbled it all up and even asked for seconds. Need I say more? To start with, clean and peel the potatoes and cook them in boiling water until fork tender (alternatively, clean the potatoes but don’t peel; wrap them in foil and roast until tender; cool and then peel). Mash them either with a potato masher or in a food processor, then stir in the ground ginger, ground nutmeg, butter or heavy cream, salt and pepper to taste. Set aside and rewarm when ready to serve. For the broccoli rabe, rinse the stems and remove any thick or damaged leaves. Bring a pot of water to boil and add the broccoli rabe for just a couple of minutes. Remove the broccoli rabe to a colander and drain well. Meanwhile, heat a large skillet over medium high heat and add the pine nuts and a dash of cayenne. Shake the skillet frequently until the pine nuts are toasted and golden. Remove the pine nuts from the skillet and set aside. Add a couple of tablespoons olive oil to the skillet along with the minced garlic and cook until fragrant. Toss in the broccoli rabe and the pine nuts and combine well with the olive oil until heated through. Remove skillet from heat and set aside. For the cod, heat some olive oil (enough to just cover the cod) in a dutch oven or deep skillet over very low heat. Cut the cod into individual portions, season with salt and pepper and carefully add it to the oil. Let the cod poach in the olive oil (keep the heat at low) until opaque and just cooked through, about 12 to 15 minutes depending on the size of the fillets. 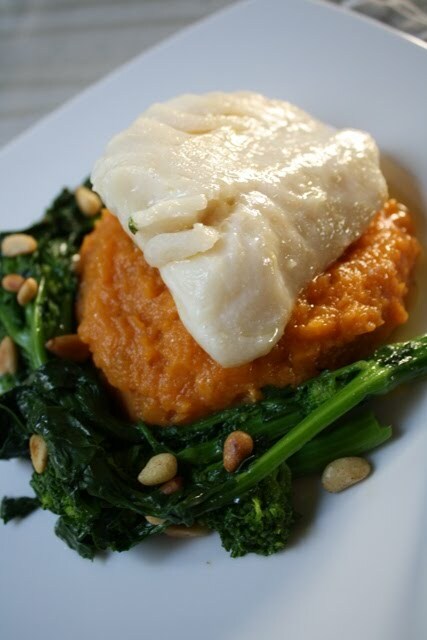 Place the mashed sweet potatoes and broccoli rabe on the plate and carefully remove cod with a spatula and place over the potatoes to serve. Try adding some fresh herbs or sliced garlic to the poaching oil so as to infuse the fish with those flavors as well. 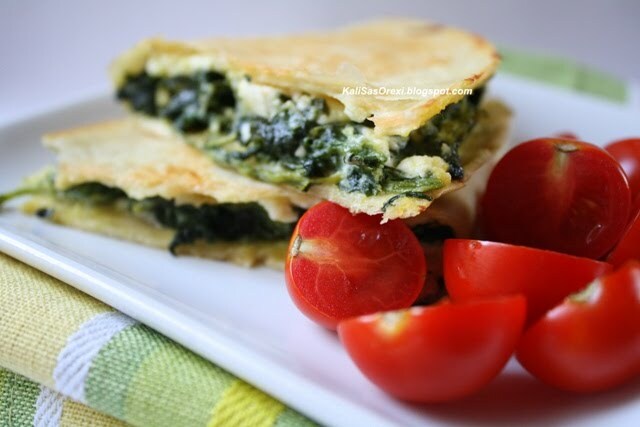 I wasn’t originally thinking I’d go with a Greek flavor profile, but the container of Feta was calling out to me much more emphatically than the block of cheddar and so my quesadillas quickly became an easy (you might call it lazy) though extremely tasty version of Spanakopita (traditional Greek spinach pie). I quickly sauteed some chopped onions, scallions, garlic and spinach then tossed in some chopped parsley and fresh mint that’s still growing in the garden. An egg, some crumbled Feta, a skillet, some flour tortillas … and voila, Spanako–Quesadillas. 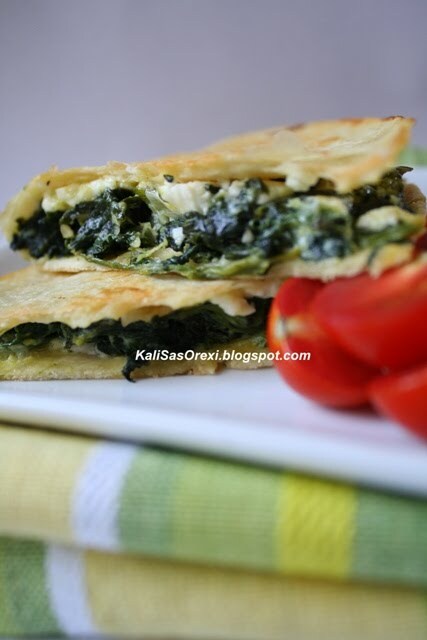 Make these as a light lunch or dinner; accompanied by a salad it’s really all you’ll need. Better yet, serve these as appetizers or quick finger foods when you’re getting ready for a casual get-together with friends. Trust me, you won’t be disappointed. Heat a couple tablespoons of olive oil in a skillet and saute the onion, scallions and garlic until softened, about five minutes. Add the spinach and cook until wilted and heated through, about five minutes more. Stir in the nutmeg, salt, pepper, parsley and mint. Place mixture in bowl and let cool slightly. Stir in egg and feta and adjust seasonings if necessary. 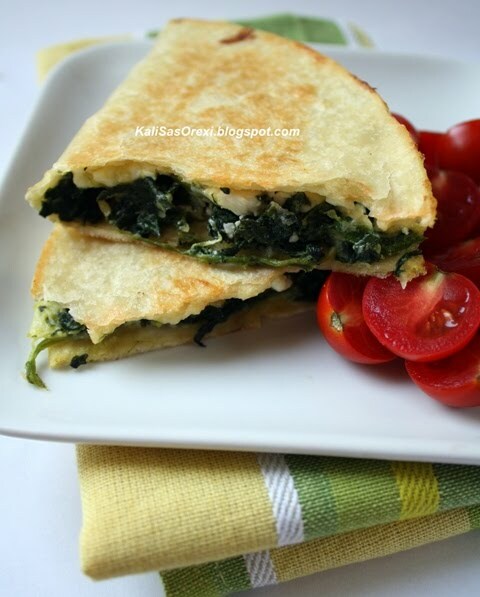 Remove the quesadilla from the skillet, cut it in half or in thirds and serve warm. 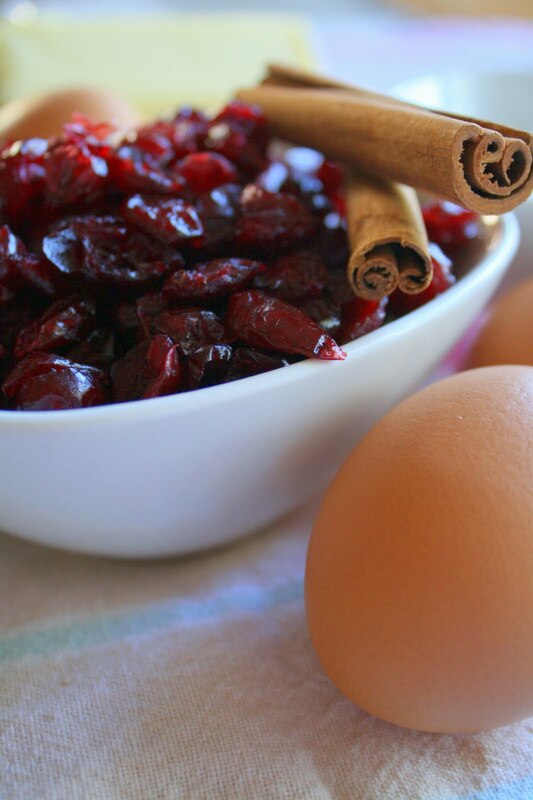 I’ve always wanted to make clafoutis but for some very, very odd reason haven’t. I’m not sure why … these little desserts are really quite simple and so versatile. A complement to any and all seasonal fruit, they are the perfect ending to a savory dinner or a sweet and simple addition to a friendly brunch. 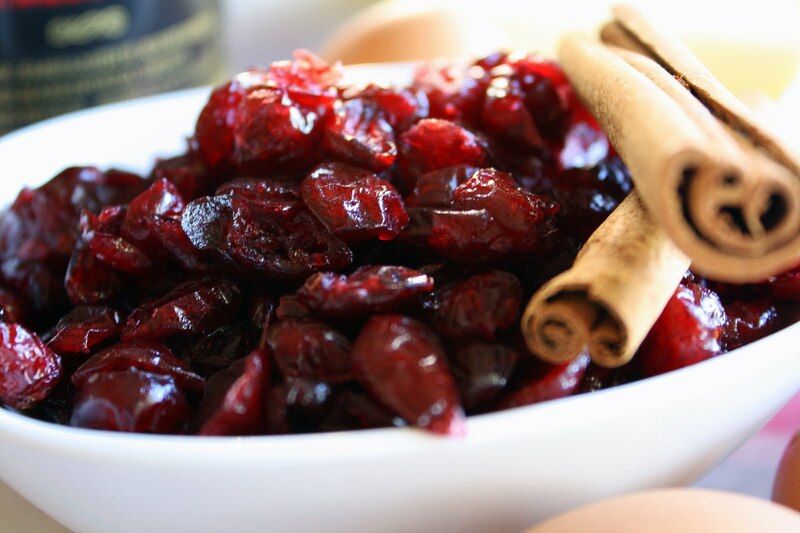 Cranberries, fresh or dried, embody (at least for me) the spirit of fall. They’re tart flavor and deep red hue just scream autumn. 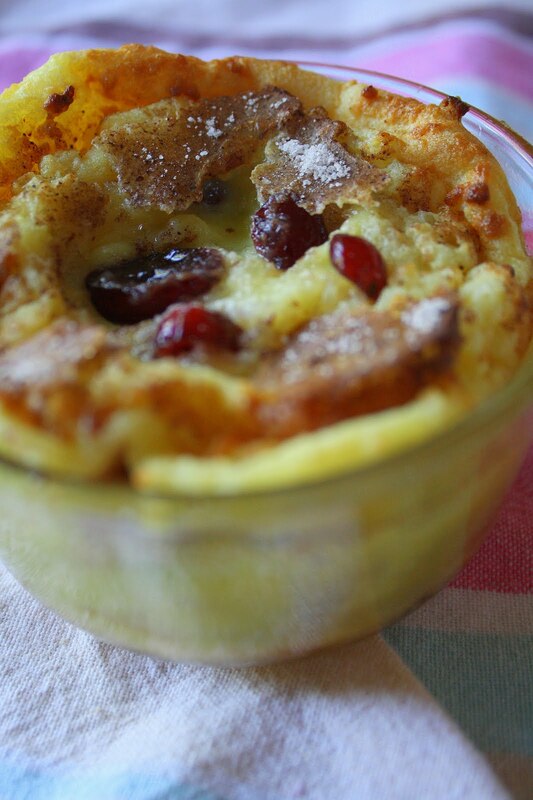 Simmered in wine and scented with cinnamon, they made the perfect base for these buttery clafoutis. 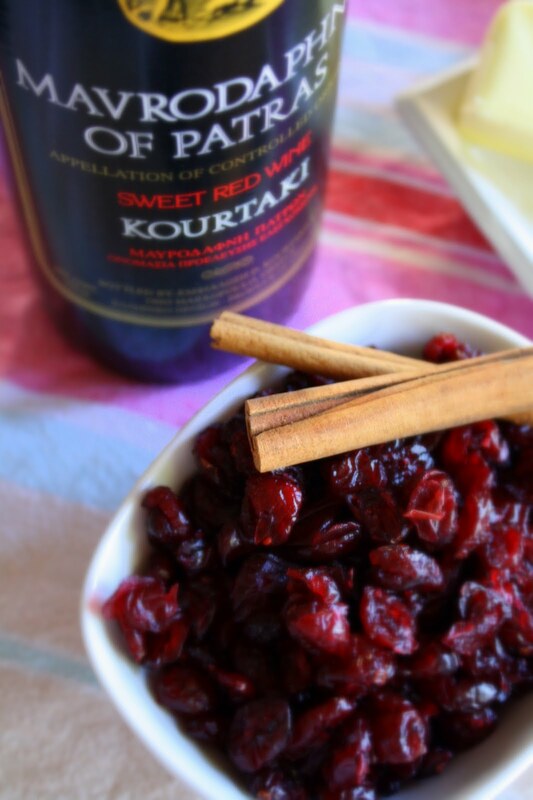 The Greek dessert wine Mavrodaphne is similar to port but sweeter and beautifully balanced the tartness of the cranberries here. 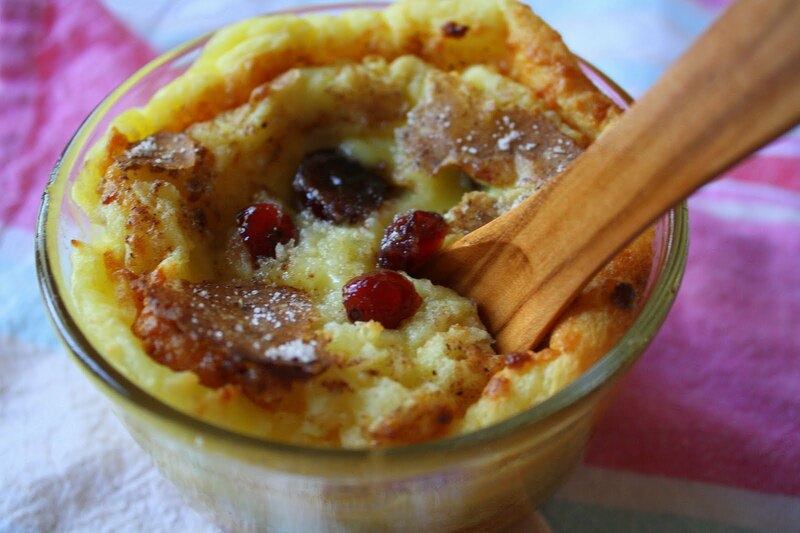 Using the dried fruit made these clafoutis even simpler and though I loved every part of the dessert, I am looking forward to making clafoutis using fresh cranberries as well. Preheat oven to 400 degrees with rack placed in center of oven. Butter either one 8- to 9-inch baking dish or 6 to 8 ramekins. 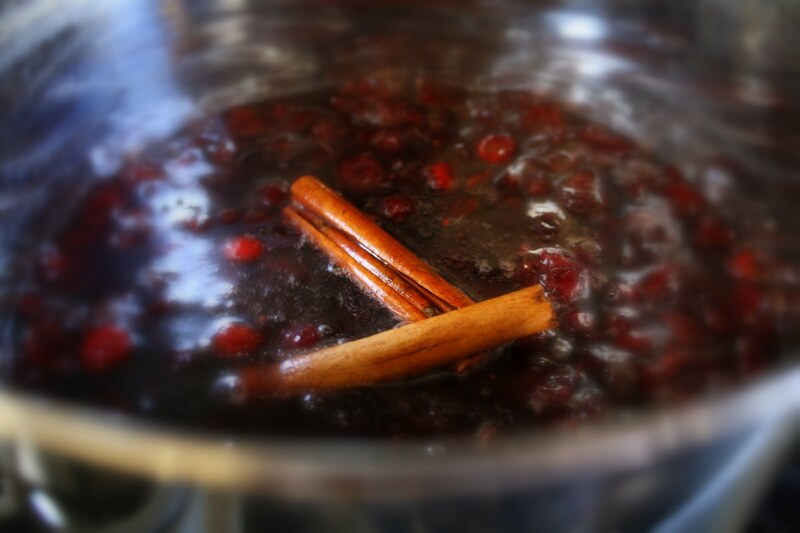 In a small saucepan, simmer the cranberries, Mavrodaphne, water and cinnamon sticks uncovered until it’s of a syrupy consistency. Pour the simmered fruit into the baking dish or ramekins and set aside. In a large bowl, whisk together the eggs, milk, butter, sugar, flour, vanilla and salt until smooth and pour into the dish or ramekins. Sprinkle the cinnamon sugar over top and bake until puffed and set in center, about 35 to 40 minutes. Cool the clafoutis briefly and serve. It’s been a while since I participated in the Leftover Queen’s Royal Foodie Joust, but I’m back this month with an entry using each of the three chosen ingredients (orange colored squash/pumpkin; black tinted stout; sugar) and lots of Fall flair. A heartwarming, soul-satisfying dish fit for Autumn is what I was going for here. So I took some flavorful butternut squash, soaked it in dark beer, coated it in brown sugar then browned it in some butter and roasted it with a bit of the beer til tender. 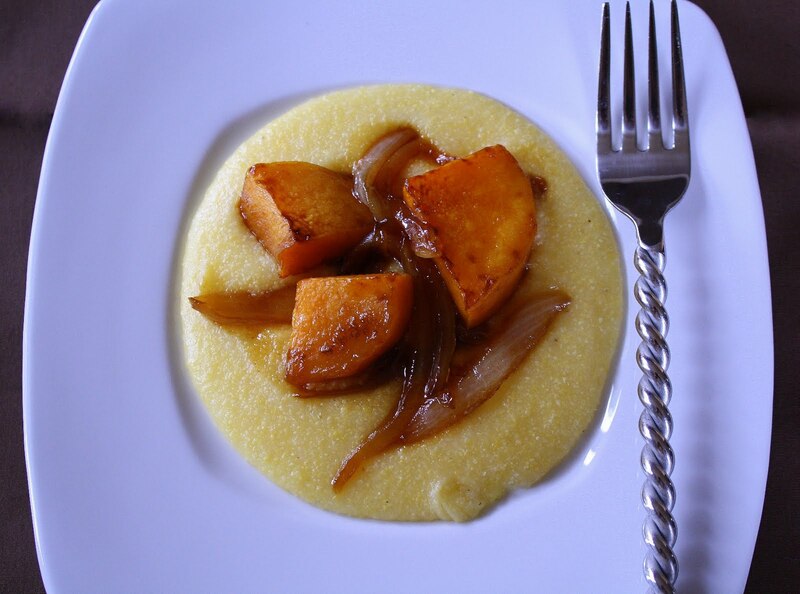 Onions caramelized with the remaining beer joined the butternut squash atop a silky polenta. Serve this as a side dish to grilled or roasted beef, veal or chicken; as a stand alone first course; or even a light main dish. I thought of adding some crispy bacon or pancetta but we’d had enough meat in our diet last week though either would add a great dimension of flavor to this dish though. Now, if you’re a food blogger and not yet a member of the Leftover Queen’s Foodie Blogroll, head on over to Jenn’s site and sign up now. You’ll be part of a great community of bloggers, you’ll enjoy some great contests and giveaways and you’ll qualify to compete in the monthly Royal Foodie Joust. Heat oven to 350 degrees. 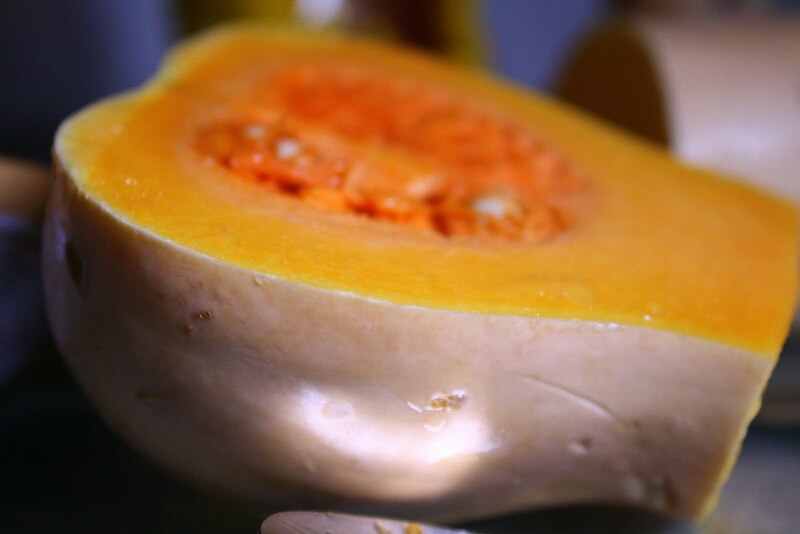 Place the butternut squash in a large bowl; add the beer and cayenne pepper and give it a good stir until all the pieces of squash are coated well. Let the butternut squash soak in the beer mixture for about 15 minutes. As the polenta cooks, heat 2 tablespoons butter in a large oven-proof skillet. 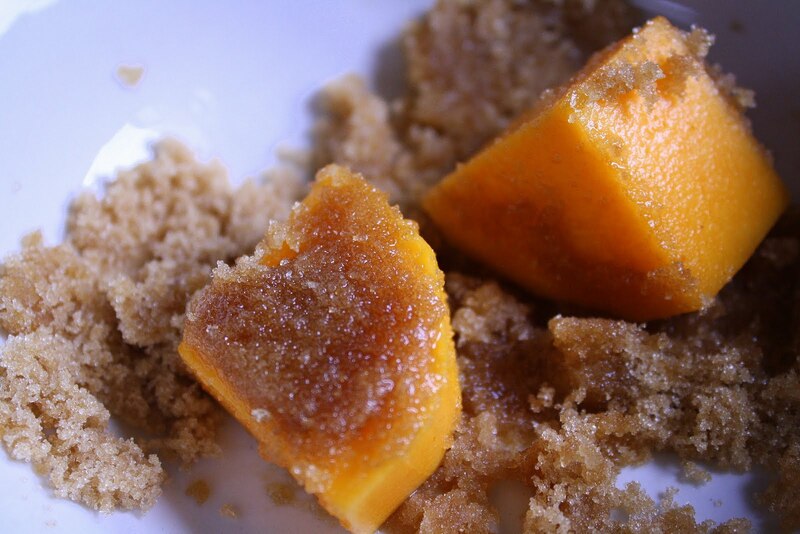 Place the brown sugar in a bowl and once the butter is heated well, take the butternut squash cubes straight from the beer, coat each piece well with brown sugar and add to the hot skillet. 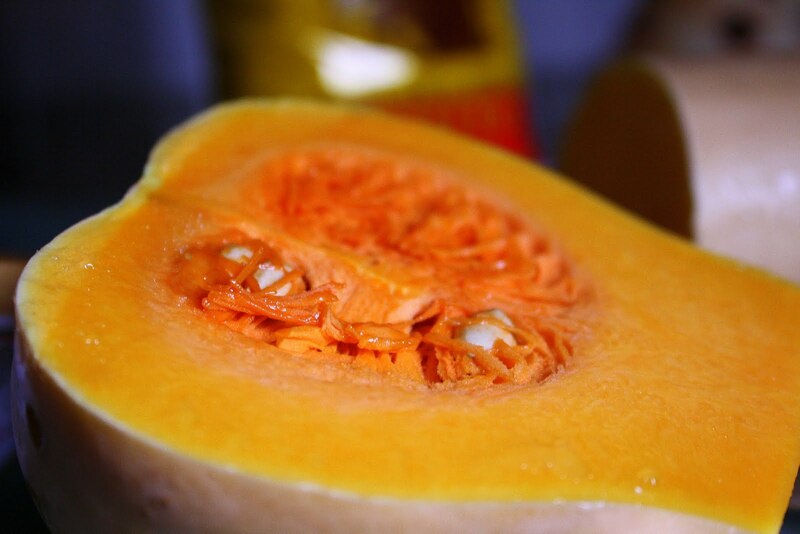 Brown all the butternut squash pieces evenly on all sides then add half the beer marinade to the skillet and place it in the oven to roast the squash until tender. As the polenta cooks, in a skillet or saucepan, add the remaining 1 tablespoon butter and the sliced onions and cook 4 to 5 minutes until softened. Stir in the remaining beer and continue cooking the onions until golden and caramelized. Spoon some polenta on the plate–or in a bowl–top with some caramelized onions and place a few pieces of butternut squash on top as well. Drizzle with any sauce from the roasted squash skillet and serve immediately. This weekend we picked the last of the figs off of our fig trees and it’s safe to say we’re all “figged” out. Since early September we’ve been blessed with literally hundreds of sweet purple-fleshed figs and I’ve made everything from a Greek fig spoon sweet; to roasted figs stuffed with Gorgonzola and wrapped in prosciutto; to a cinnamon-spiced fig jam; to two large batches of vanilla-scented fig compote. Not to mention that we ate dozens of these little fruits as is. On Sunday morning, I opened my fridge to see a half full (some might say half empty) container of ricotta on one shelf and a jar of fig compote on another. The kiddies asked for a batch of pancakes so it was only natural I whip up some ricotta pancakes and serve them with a spoonful of fig compote, right? I’ve seen some ricotta pancake recipes call for separating the eggs, adding yolks to the initial batter, then whipping the egg whites to stiff peaks and folding those in as well. I have to admit, I think those steps are kind of unnecessary. Not that I’ve done any experiments to officially note any differences between either method, but I’ve always been left satisfied with the fluffy, light pancakes my simple whisking of all ingredients has yielded. So here’s my recipe for ricotta pancakes. I flavored this batch with a splash of my aunt’s homemade vanilla but feel free to add either orange or lemon zest to perk these pancakes up as well. 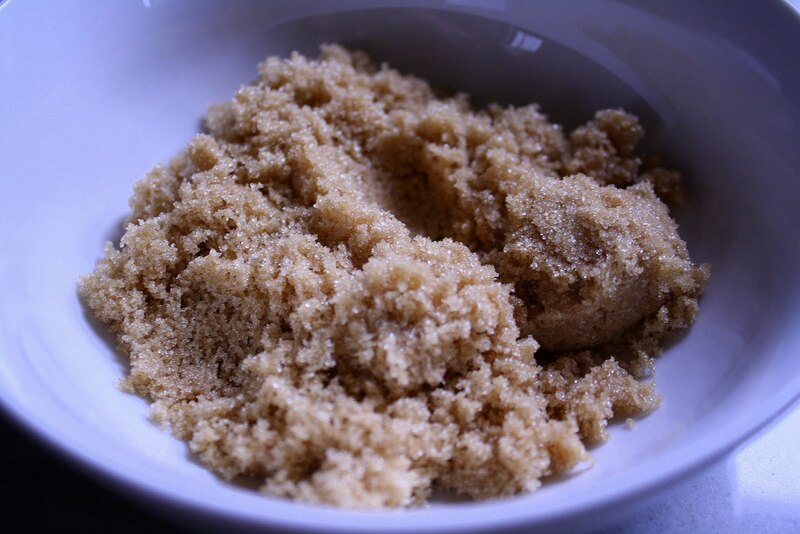 In a large bowl whisk the flour, baking powder and salt until well combined. Add the sugar, eggs, vanilla, milk and ricotta and whisk briefly (batter should be lumpy so don’t over stir). Note: If the batter seems much too thick add a splash of milk to thin it out. Heat a griddle or skillet over medium-high heat and once hot coat with a little butter. Drop batter by 1/4 cupfuls onto the hot griddle and cook until small holes begin to form on top. Using a spatula, flip the pancake and cook just a couple minutes more until golden. Note: To keep other pancakes warm while making the rest, place on a baking sheet, cover with foil and heat in a 175-degree oven. 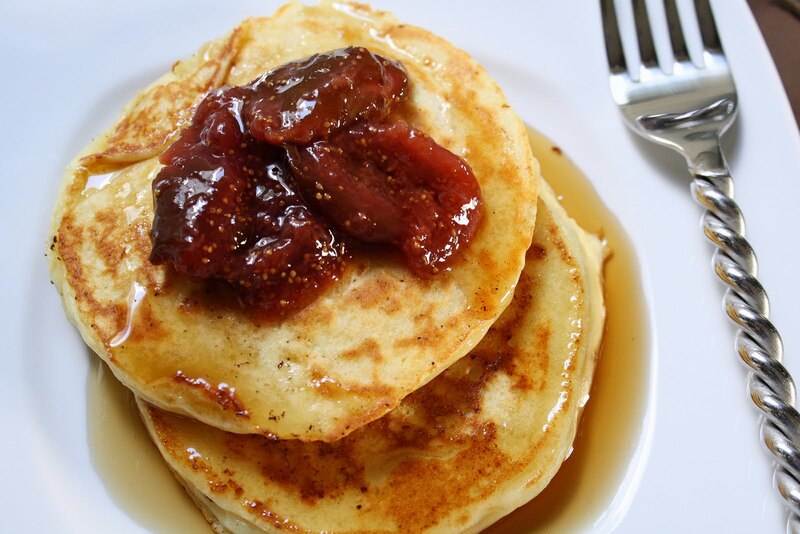 Serve pancakes with a spoonful of compote and a drizzle of maple syrup. Clean and dry about three cups of fresh small- to medium-size figs. Peel the figs carefully. Slice the figs in half and add to a saucepan along with 1/2 cup sugar and 2 cups water. Cook until the figs are really tender and reduced to a jam-like consistency. If needed, add a bit more water to continue cooking figs until tender. Once done, remove pan from heat and stir in a teaspoon of vanilla extract. Let compote cool then spoon into sterilised jars; cover tightly and store in the refrigerator. Serve over pancakes, ice cream, yogurt or mascarpone cheese.